A little info on the Joule Thief for those of you that have not heard about it. In the article "One Volt LED - A Bright Light" written by Z. Kaparnik from Swindon, Wilts, UK published in the November 1999 issue of the magazine "Everyday Practical Electronics" in the section "Ingenuity Unlimited"; described how to make a "Micro-torch circuit" using a very compact high frequency, high efficiency DC-DC converter design. 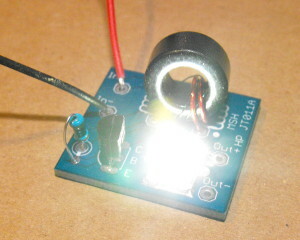 The circuit consisted of a hand wound micro toroid, a 10K resistor and a ZTX450 transistor. The circuit was designed to run a LED that had a forward voltage drop greater than 1.8VDC from a single cell battery (1.5VDC) and could run as low as 750mV, this meant it could run from nearly dead batteries. This circuit has been propagated, experimented with, and changed at numerous sites and discussion boards and most significantly can now run white LEDs that have forward voltages greater than 3V. Someone nicknamed the circuit "Joule Thief" and it has stuck ever since. So I have created my very first PCB and sent out for fabrication on Oct 17th. The PCB's finally arrived today (Oct 27th). I built the first Joule Thief kit using a 2N2222 T0-39 can package as I am waiting for the T0-92 plastic package 2N4401 to arrive tomorrow. I tested this one on the bench it starts up at 520mV and shuts down at around 470mV. At 1.55V in the circuit was drawing 100mA. I cannot wait to get the 2N4401 and build another one to see where it is running at. I almost forgot to include a photo of the bare PCB. I created a visual aid with the Joule Thief schematic to make the Joule Thief kit component connection easier to identify. After you install the LTspice software and open the file JT.asc just click the little running man icon. Then click individual nodes to display what the simulation produced. The probe will show voltage. If you mouse over each portion of the components you will see a current probe that will show the current flowing in the simulation where you click.